What do you do when a book you've been asking, wishing, begging for finally arrives, several years later than you'd have liked it to? When several Christmases plus your Birthday have come in one go? You complain about it, of course. So, to be clear, this is no way long enough. We want more, and we want it now! 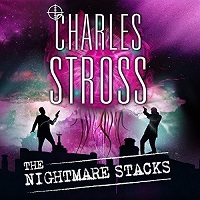 He now has 8 published Novels (one of them published in two volumes for ‘commercial considerations’) and 2 collections of short stories under his belt; he has been labelled a “sociological futurist Lovecraft” in a discussion on Charlie Stross’ blog - a quip which predates the story at hand, but is nevertheless fully appropriate, too. The Freeze-Frame Revolution is set in his Sunflowers universe, ie the same universe in which the Hugo-Award-winning Novelette The Island (as well as a raft of other stories and snippets published over the last few years) is set in, and follows the same wormhole-building ship/asteroid and its dysfunctional crew and AI. Whilst he wrote novels, too, I always consider Fredric as one of the grand masters of the short - sometimes very short - story, frequently with an surprising twist to it that can turn an entire story on its head and forces the reader to start again. This is not one of those, but the twist is a classic. from Latin solus, meaning 'alone', and ipse, meaning 'self', is the philosophical idea that only one's own mind is sure to exist. As an epistemological position, solipsism holds that knowledge of anything outside one's own mind is unsure; the external world and other minds cannot be known and might not exist outside the mind. 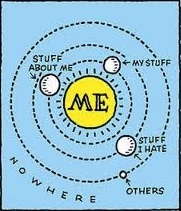 As a metaphysical position, solipsism goes further to the conclusion that the world and other minds do not exist. Once in a while a book comes your way which transcends boundaries - sometimes because the author is rooted or interested in several things, sometimes because the book, the story, the characters ran away with the it and created something bigger and more complex in the process; and sometimes because, like with An Android Awakes, the originators (Mike French, and illustrator Karl Brown in this case) set out to do so - successfully, in this case. 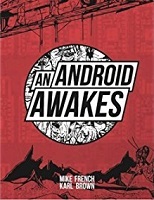 An Android Awakes is a hybrid novel, part classic SF book, part graphic novel, with both parts interlinked and feeding off each other. It’s an interesting concept, going way beyond the classic ‘illustrated story’ approach, whilst adding the depth of story and character which pure graphic novels frequently struggle to bring to the table from the text portions. The closest I can compare it to, in format and interaction at least, is Ian Sinclair’s Slow Chocolate Autopsy, although that is a completely different monster of a book. The book is set in a future where all or nearly all fiction, as well as other creative tasks, are done by androids, and not humans anymore - so much for there being areas where robots will never be able to replace humans! Metaphorosis describes itself as an online speculative fiction magazine which publishes an original story every week, plus book reviews and other content related to the topic. It has been going for two years now, and has published 'Best of' collections for both of those, plus other books and collections available in print format, too. Metaphorosis: Best of 2017 contains a Baker's Dozen (that is to say 13) stories selected by the magazine's editor, B. Morris Allen, plus a group of volunteer 'trusted readers'. These cover, as you would expect, a substantial range of approaches, topics, and writing styles. I felt that there was a bias (and no, not in a problematic way at all) towards societal, human-centred, non-technology, 'feely' stories. “Sad” seems to be the most frequent adjective I took down when taking notes from the stories – not in a bad, or tear-jerking way, but just in the outlook of a number of stories. A good number are classic SF tropes, others are Fantasy, or in some cases rather Myths, new or re-imagined ones (and yes, this boundary if very fluid, both into SF and Fantasy). Below I will provide capsule reviews of the individual entries, which by its very nature will spoil some of the content – if this is a problem for you then stop here, with my recommendation that this is a great, varied, and fascinating collection, which you should seek out and enjoy yourself! Oh, the name of the magazine, Metaphorosis, is a clever mis-spelling of Metamorphosis (the Kafka kind) – and whilst I had actually been hoping for something even clever-er I think that it's cool and evocative as it is.